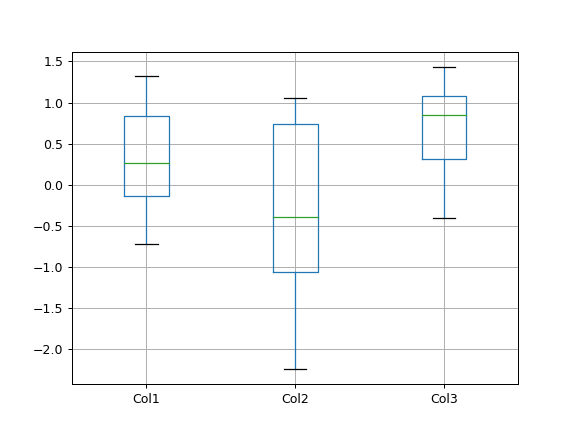 Make a box plot from DataFrame columns. 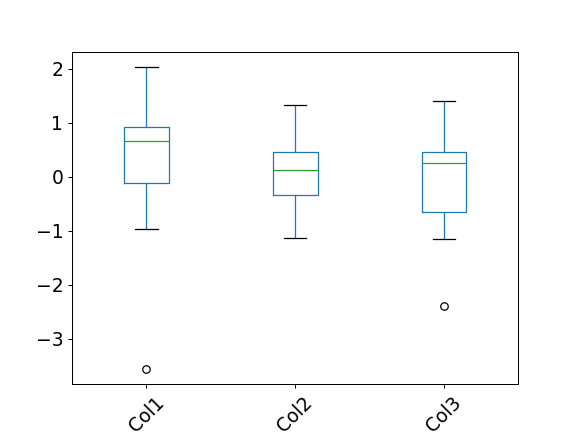 Make a box-and-whisker plot from DataFrame columns, optionally grouped by some other columns. 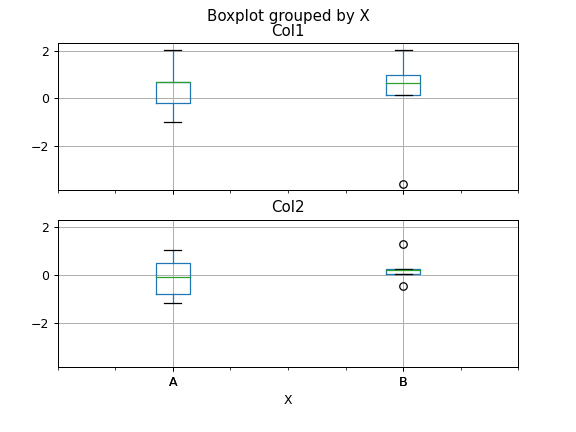 A box plot is a method for graphically depicting groups of numerical data through their quartiles. The box extends from the Q1 to Q3 quartile values of the data, with a line at the median (Q2). The whiskers extend from the edges of box to show the range of the data. The position of the whiskers is set by default to 1.5 * IQR (IQR = Q3 - Q1) from the edges of the box. Outlier points are those past the end of the whiskers. For further details see Wikipedia’s entry for boxplot. Column name or list of names, or vector. Can be any valid input to pandas.DataFrame.groupby(). Column in the DataFrame to pandas.DataFrame.groupby(). One box-plot will be done per value of columns in by . 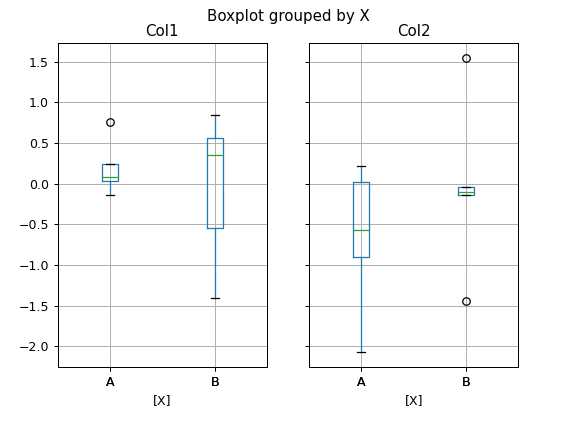 The matplotlib axes to be used by boxplot. Tick label font size in points or as a string (e.g., large ). The rotation angle of labels (in degrees) with respect to the screen coordinate system. Setting this to True will show the grid. The size of the figure to create in matplotlib. For example, (3, 5) will display the subplots using 3 columns and 5 rows, starting from the top-left. The kind of object to return. The default is axes. ‘axes’ returns the matplotlib axes the boxplot is drawn on. ‘dict’ returns a dictionary whose values are the matplotlib Lines of the boxplot. ‘both’ returns a namedtuple with the axes and dict. when grouping with by, a Series mapping columns to return_type is returned. If return_type is None , a NumPy array of axes with the same shape as layout is returned. 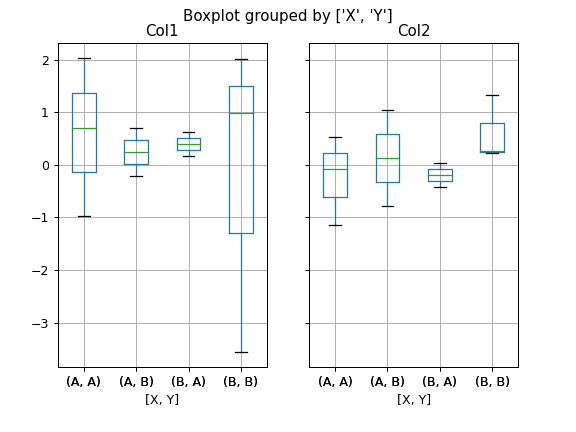 All other plotting keyword arguments to be passed to matplotlib.pyplot.boxplot().